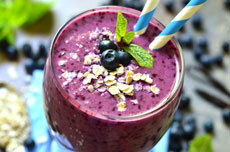 This easy, tasty smoothie gets its tangy sweetness from berries and a touch of honey. Using prepared oatmeal gives you extra fiber and a great way to use the leftovers from breakfast! Place ingredients in a blender, process until smooth and serve.